I was surprised that they all had long extendable antennas! Not sure how that will go down in the UK where we’re used to very slick mobiles without antennas. I’ve been trying to talk to people here about the programming they watch on it – looking for insights into what’s worked and what doesn’t. Interstingly, they keep telling me, ‘It’s just TV. Nothing special.’ And, they don’t seem particularly aware of any interactivity – other than the programme/channel guide – on the platform. This is, of course, a consumer perspective – I know there’s more going on behind the scenes editorially. Functionally, two cool features I saw were texting alerts about live programming reminders to friends in your phone contacts and DVR functionality, which one user really raved about liking. Consumers I’ve been talking to have also been complaining about problems with reception and been telling me that WiPro is a better way of getting video content to their phones. I need to check the WiPro stuff out but no one I’ve talked to has been able to show it to me on their phone yet. I hope that’s not the case. From what I’ve been seeing at work, I think it can offer us new opportunities to create specific content for audiences that are on the move and who have different user and content needs in those situations. I did two speeches back-to-back earlier today at the X|Media Lab and Mobile Content 2008. In both, I gave an overview of what the BBC’s been doing on mobile; which is slightly ironic since the Koreans are so far ahead of the UK, technologically. Hopefully I had alot to share with the audiences about the content side of things. The theme of this X|Media Lab is “3D Internet: Virtual, Visual and Social.” I have to admit, I don’t know a hell of alot about the 3D internet other than that it exists and has a huge audience. Before spending last week at Crossover Nordic, I didn’t realise just what a huge audience it has but when it was put in the context that many of the big worlds like World of Warcraft and Second Life have more inhabitants than many real-world countries, my ears perked up and I realised it was time to pay more attention. Good thing I’m here. But what on earth was I going to talk about? 1) Mobile can provide a persistent and ubiquitous connection the worlds, extending the opportunities for play and connection to the worlds. Users of these worlds are ‘addicted’ to them and I suspect would welcome any opportunities to be more connected, more immersed and able to constantly participate ‘in world.’ I understand there are some Flash clients being developed for phones that will hopefully create 2D or 3D versions of the worlds. This seems good, but like a ‘mini-me’ type of approach; and I’m not sure this will work. Will the screens be big enough and good enough to render something useful? Will on-the-go users really want to pay this much attention? Or would they rather a thinner connection when the world is in their pocket at work? On thing I spend alot of time telling people is that mobile ‘isn’t just a mini version of the web.’ Sure, mobiles access the web, but a mere copy and paste approach doesn’t always ensure success. I think it might be cool to see if the types of services that help audiences stay in touch with their real world would be popular with helping them stay in touch with their virtual worlds. SMS alerts sent from the worlds or text messages from or between characters in the world seem like an obvious opportunity. Imagine a guild of players in World of Warcraft texting out of the world to players in another guild to get online and help them in a battle where they need backup/support. Texts would reach the players and they could rush from the real world back to their PCs to get in world and play. And what types of web apps could provide data from the worlds to thin mobile clients, widgets or even simple mobile web pages? 2) Thinking about this type of connection and play, I wonder how these could be crossed with Alternate Reality Games. ARGs are doing more out of home and with the crossover between real the real world and mobile and I think that this type of crossover could be replicated into the virtual world – possibly even triangulated between reality, alternate reality and the virtual world. What a game that could make. Can you geocache in any virtual worlds (yet)? 3) So how could all this work. Well, I’m no expert. 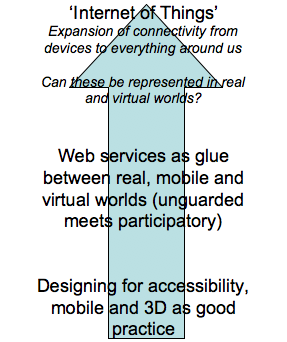 But I have an idea that flexible, open web services could sit in the middle of these different ‘worlds’ (aka media) and provide the glue that lets transactions and interactions flow between them. – If the friend likes the song, they could add it to a Last.fm style playlist or even buy the track using real or virtual currencies. To elaborate… If we’re moving to a world where the ‘Internet of Things’ is becoming a reality, then everything around us will be connected, not just our devices. This should apply to things in the virtual world as well. If flexible and open web services can connect to these via mobile devices, strong connections between the real and virtual world can be created. Behind this a strong system design strategy would be required. Expanding from the idea that ‘Designing for Accessibility is good design’ (because everyone can use it), you could move to the idea that designing for mobile is (also) good design because everyTHING (in the real and virtual worlds) can access and use the service. I’m obviously not going to be the only one thinking about this stuff but sitting in a room full of experts on this world has me really excited. Neil Katz, from IBM, told me about a few examples where you can start to see this stuff coming to life in a very basic way. So I’m in Seoul, Korea for X|Media Lab and Mobile Content 2008 and upon landing was immediately looking for some examples of the cool mobile/wireless devices and gadgets that Korea is so famous for. 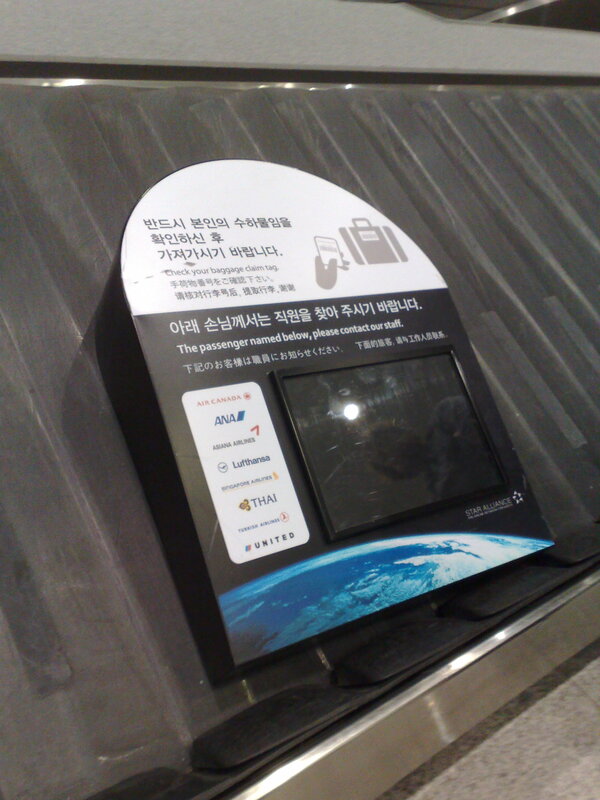 This badboy is a wireless display that goes around on the luggage conveyer belt at the airport to notify people that their luggage has been lost. Glad I didn’t see MY name on it, but couldn’t help think it was pretty cool and showed JUST how wired Korea is. After a week in Sweden, I thought I should post about two Swedish music acts that I’m loving at the moment. You can’t help but think of The Cure (one of my all time favourites) when you hear the vocals but they’ve got a fresh indie sound that I’m loving. I’m always amazed by how much great music Sweden produces and how much I enjoy it. Bands like these are great treats that prove its not all Shlager (which I also love, but admit is pure cheese). 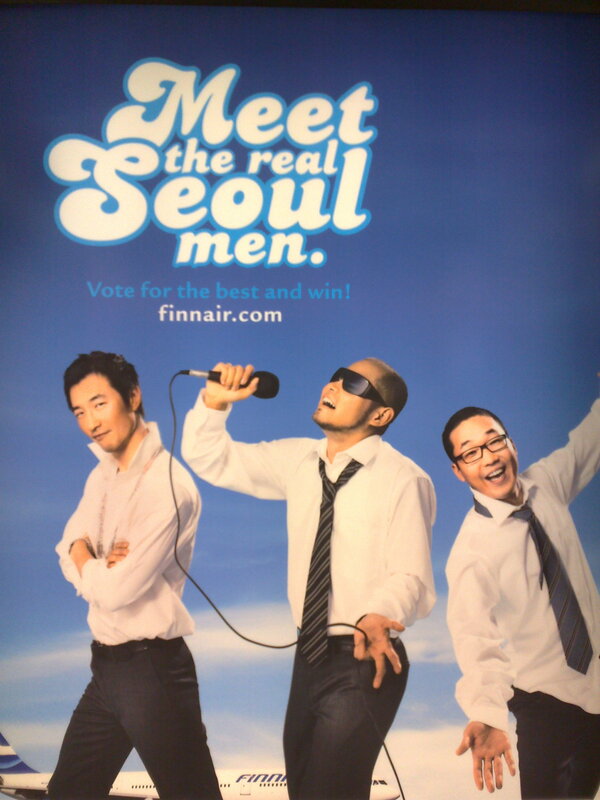 I’m in Korea now… I wonder what type of musical treats I’ll find. Let me know if you have any suggestions.